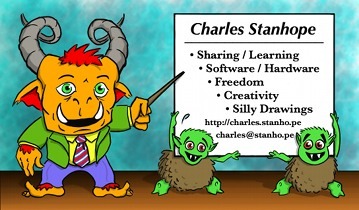 This site is the web home of Charles Stanhope, a software/hardware developer interested in programming languages, open platforms, art, craft, diy, making a living, etc. This is the nascent website of my home on the web. It still needs a lot of work, but it's a start. I intend this to be the center of my presence on the web á la IndieWeb, and a place where I can have fun learning about web technologies and sharing what I know. Currently inspired by the following quote that I heard while attending Open Source Bridge. I'm working with several other people in my community (east side of Portland) to get an interest group together. We call ourselves EAST Knowledge. If you live closer to Gresham than to Portland, and have an interest in technology, please let us know. We'd love to hear from you. Just to Get Some Attention - Old blog, soon to be consolidated here. There's probably other places you may find me around the web, but I'm working to consolidate my online presence to this domain. Eventually I'll get it all straightened out. Emacs: switched back after a short fling with Sublime Text. Libre software is best software. Gandi: A great domain registrar with good values. W3C: The cumulative work of many, many people. IETF: More great work of many, many people. More: More free/libre software than you can shake a stick at, which is even more great work of manby, many people.